Start off your visit on the 4th (Thu): hike along Kuniya Walk, explore the striking landscape at Uluru, then take in the exciting artwork at Walkatjara Art, then get engrossed in the history at Uluru-Kata Tjuta Cultural Centre, and finally hike along Uluru Hiking Path. For reviews, traveler tips, more things to do, and tourist information, use the Uluru-Kata Tjuta National Park tour itinerary maker tool . Mumbai, India to Uluru-Kata Tjuta National Park is an approximately 20.5-hour flight. You can also do a combination of train and flight; or do a combination of flight and car. Due to the time zone difference, you'll lose 4 hours traveling from Mumbai to Uluru-Kata Tjuta National Park. Plan for slightly colder temperatures traveling from Mumbai in April, with highs in Uluru-Kata Tjuta National Park at 34°C and lows at 17°C. Cap off your sightseeing on the 4th (Thu) early enough to travel to Melbourne. 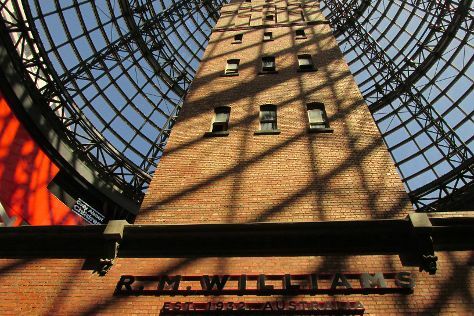 Kick off your visit on the 5th (Fri): see the interesting displays at Melbourne Museum, then look for gifts at Lightning Ridge Opal Mines, and then wander the streets of Melbourne Central. Here are some ideas for day two: get a taste of the local shopping with The White Room Interiors, then brush up on your military savvy at Shrine of Remembrance, and then take a stroll through Collins St/Swanston St.
To see maps, other places to visit, ratings, and more tourist information, go to the Melbourne travel route app . Getting from Uluru-Kata Tjuta National Park to Melbourne by flight takes about 5 hours. Other options: drive. Plan for little chillier temperatures traveling from Uluru-Kata Tjuta National Park in April, with highs in Melbourne at 23°C and lows at 11°C. Finish up your sightseeing early on the 6th (Sat) so you can travel to Sydney. Start off your visit on the 7th (Sun): explore the world behind art at Brett Whiteley Studio, then make a trip to Sydney Opera House, then take in nature's colorful creations at Royal Botanic Garden Sydney, and finally appreciate the extensive heritage of The Rocks. 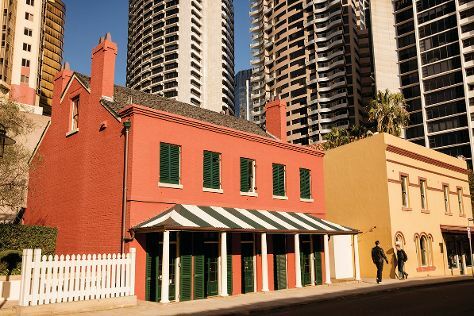 Here are some ideas for day two: browse the eclectic array of goods at Sydney Fish Market, then examine the collection at Australian National Maritime Museum, and then take a stroll through Darling Harbour. To see ratings, photos, reviews, and more tourist information, read Sydney attractions planning tool . Traveling by flight from Melbourne to Sydney takes 3.5 hours. Alternatively, you can do a combination of shuttle and flight; or drive. Traveling from Melbourne in April, plan for somewhat warmer nights in Sydney, with lows around 17°C. Finish your sightseeing early on the 8th (Mon) to allow enough time to travel to Port Douglas. To find other places to visit, traveler tips, where to stay, and other tourist information, refer to the Port Douglas tour itinerary planner . You can do a combination of flight and shuttle from Sydney to Port Douglas in 7 hours. Alternatively, you can drive; or do a combination of train and bus. In April, Port Douglas is a bit warmer than Sydney - with highs of 34°C and lows of 25°C. Finish your sightseeing early on the 9th (Tue) so you can drive to Cairns. Kick off your visit on the 10th (Wed): see some colorful creatures with a scuba or snorkeling tour. Plan trip to Cairns with our itinerary maker to find out where to go and what to do. Getting from Port Douglas to Cairns by car takes about 1.5 hours. Other options: take a bus; or take a shuttle. In April, daytime highs in Cairns are 34°C, while nighttime lows are 26°C. On the 11th (Thu), wrap the sightseeing up by early afternoon so you can travel back home.